…a place of longing for what has been rather than hoping for what could be. A true artist, Violette is passionate and emotional. Climbing back into life after suffering a loss, she teeters on the precipice of a new relationship with Christian, a psychologist who not only understands her struggles but offers safety and his heart. As Violette and Christian begin to feel something they both thought impossible, tragedy strikes again. Violette becomes trapped in a place of past memories–and she finds that she may not want to come back. What would it be like to choose a place between the past and the present? This is a unique women’s fiction novel that put me in mind of Lisa Samson’s Tiger Lillie. It has the same free-flowing format of a story-within-a-story that gives deeper insight into each of the major characters. Both of the major protagonists are widowed, so this will strike a strong chord in anyone who has lost a spouse—both recently or many years ago. This also explores the difficulties of learning to love again, of unfinished grief, of tenuous faith. Violette and Christian (and Violette and Saul) are such different personalities that it was interesting to watch their interactions—their fights, misunderstandings, resolutions. 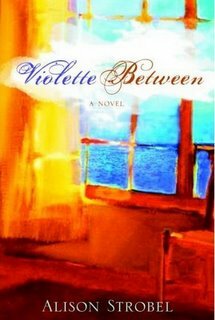 I personally had a hard time relating to Violette because she’s completely opposite of my own personality, but other women who have that spontaneous, romantic streak will find much of themselves in her character and even her faith. This is a wonderfully edgy novel in that the characters themselves are not strong Christians, although at points they believe themselves to be, while at other points they don’t care if they are or not. This blurred area of faith/not-faith is refreshing to see in a story. I personally wouldn’t give this to a teenager to read because the mature issues of widowhood will probably not resonate with them, but any other older reader will find slices of Violette and Christian that they can relate to. I, too, loved Violette Between and found myself comparing her to Lisa Samson. I'll be blogging about it later this week myself.